Oscar was created by Intuitive AI, a startup with plans to sell its solution to corporate social responsibility teams and property managers in busy settings such as airports, universities, and large corporate campuses. Oscar sorts trash using a computer vision system currently being tested in an airport in Vancouver, Canada as well as places like Simon Fraser University. 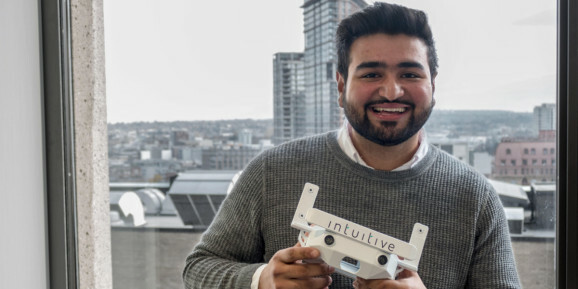 A solution for residential settings is also being explored with the cities of Toronto and Vancouver, Intuitive AI CEO Hassan Murad said during a presentation at Deep Learning Summit held last week in San Francisco. Jokingly referred to as WasteNet inside the company, thousands of images of garbage that can be sorted into hundreds of categories was collected through dumpster diving. The system is being trained to recognize trash items from partially visible visual cues, like when a person’s hand is grasping a Coke can or a crumpled-up bag of chips, Murad said. Murad was recently named by Forbes Insights as one of five AI entrepreneurs on the rise. Intuitive AI wants to solve the problem highlighted in a World Bank statistic: 98 percent of waste that people in places like the United States throw away ends up in landfills, but more than 80 percent could be recycled. First Oscar will supply data to property managers who can get real-time information about which bins need to be emptied, saving janitorial staff time. Data collected could also help property managers prove how green or efficient a building is for things like LEED certification or a sustainability rating. In the future, Oscar wants to sell location-specific data to businesses about consumption habits. “Over time, Oscars that are attached in malls, universities, airports — the entire city, essentially — extract information about what brands are being preferred, what do people like to eat at a specific time of day, and that’s extremely interesting data we really want to provide to quick-serve restaurants, buildings, to understand where they can better serve their customers,” he said. Systems like Oscar could also lead to savings for cities. For example, the City of Toronto stated that each 1 percent reduction in cross-contamination of different recycling could save up to $1 million. The first iteration of Intuitive’s trashy solution used computer vision to automatically sort trash for people, but that approach was abandoned in favor of a camera and 32-inch screen, because the earlier system made no attempt to better educate users or get them to change their behavior. “You’re asking people to continue being ignorant about their consumption and just, you know, keep throwing things out,” Murad said. In initial tests, people spent much more time sorting their trash items and properly throwing them away than the traditional method of hanging a sign with basic examples above each bin. Intuitive is currently part of the Next AI accelerator in Toronto and the VentureLabs business accelerator at Simon Fraser University. A home trash-sorting garbage can, also named Oscar, got a bit of traction last summer but canceled its Kickstarter campaign. Other forms of computer vision that could change the way people see food include Bixby Vision for identification of food in your fridge that Samsung is testing in its Family Hub refrigerators, and the IBM Watson Decision Platform for Agriculture, which makes predictions about things like crop health and yield.